Last month, he returned with “National Security,” another socially conscious, politically themed drama inspired by the true story of late politician and democracy activist Kim Geun-tae. The film was premiered during this year’s BIFF, and Chung received much attention from the press by saying he wants the current presidential candidates to see the film ― which openly criticizes former president Chun Doo-hwan’s military regime in the ‘80s and consists of hard-to-watch, graphic torture scenes throughout. The 66-year-old director made another critical remark on Wednesday, this time about the current film distribution system which he thinks makes it difficult for independent or small-budget films to secure screens. The timing could not have been better ― his upcoming documentary, “Ari Ari the Korean Cinema,” features the history of Korean cinema and the issues that the local film industry face today. 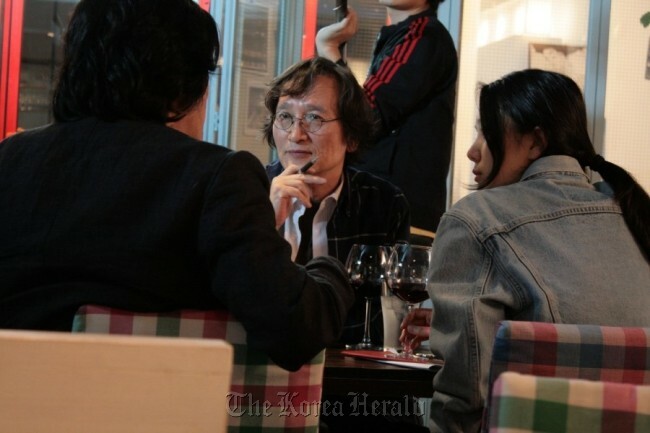 For the documentary, Chung met with about 100 cineastes, including directors Im Kwon-taek, Park Chan-wook, Bong Jun-ho, and Kang Je-kyu. They also talked to the country’s top actors and actresses, including Ahn Sung-ki, Song Kang-ho, Choi Min-sik, Bae Jong-ok, Kang Soo-yeon and Kim Hye-soo. The interviews began in 2009 and continued to early this year. While doing the interviews, Chung worked with actress Yoon Jin-seo, who is best known for her performance in Park Chan-wook’s “Oldboy.” The 29-year-old brings her own perspectives to the film, as an actress who belongs to the younger generation. The two, as a team, discuss Korean cinema with their interviewees, often asking them difficult questions in front of the camera. “It was certainly meaningful to talk to actors like Park Joong-hoon and Ahn Sung-ki and learn about their old days in the past,” Yoon told reporters on Wednesday. Chung and Yoon ask questions that are personally related to their own careers. Before he made a comeback with “Unbowed” last year, Chung had a number of his projects rejected by major investors and production houses. In the film, he questions why major film companies in the country prefer working with up-and-coming directors ― it turns out it is because it is easier for the companies to take control over the products ― and how challenging it is for older directors like himself to produce the kind of movies that they want to make. “Unbowed,” which was based on the true story of Kim Kyung-ho, a math professor who was convicted for shooting a crossbow arrow at a judge, was a low-budget production of 1.5 billion won. The movie was successful at the box office, drawing some 3.4 million viewers. “Making ‘Unbowed’ was only possible because the actors helped me,” Chung said. “Ari Ari the Korean Cinema” opens in local theaters on Dec. 6.